...very pedestrian compared to those produced by the 90 PhDs employed by the USD 10 billion quant shop, Renaissance Technologies. 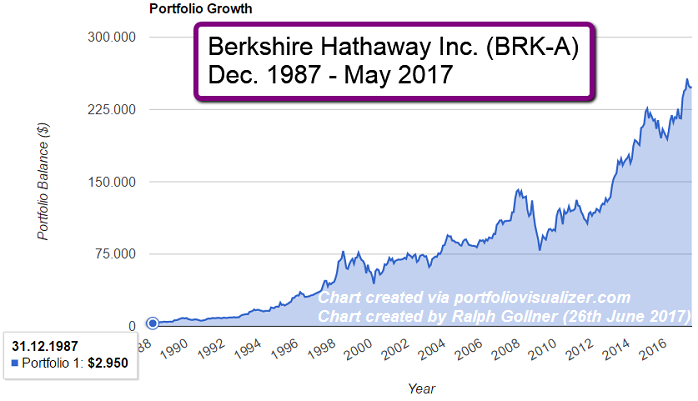 According to Bloomberg, the notoriously secretive hedge fund has delivered an extraordinary compound annual average return of 40.6 per cent after its huge fees since 1988 (or 2.4 times annually more than Buffett). 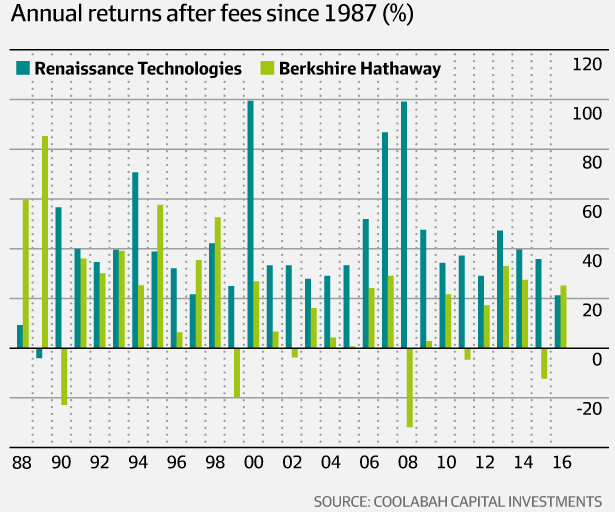 More remarkably, Renaissance has had only one negative year (Buffett has endured six) and two years (including its single loss) in which calendar year returns have been less than 21 per cent over the past three decades. So what is Renaissance doing? Harnessing vast processing and intellectual firepower to sift through all that market noise to isolate subtle valuation mistakes and/or patterns in the way investors price assets that Renaissance can profit from on a high-frequency basis. In "More Money than God" Sebastian Mallaby explains that "part of [Renaissance's success] lay in the choice of the short term". "By examining a commodity's behaviour over brief periods, [they] could collect thousands of observations, boosting [their] chances of finding repetitive patterns that were statistically significant," Mallaby says. "Short-term signals were likely to be more valuable as well as easier to find. If you can predict which way a commodity will move over the next few days, it takes only that long to place your wager and collect your reward." Whereas value investors "aspire to buy a company that will double in two years, a statistical trader who makes a quarter of a per cent in 24 hours will end up considerably richer". "Predictions over the short-term tend to inspire more confidence than the long-term sort," Mallaby argues. "There's less time for unforeseen factors to knock the forecast off target. Because it was dealing in short-term predictions that were relatively robust, the [Renaissance] team could leverage its bets and magnify its profits."